Today we are told that we under-estimate ourselves and our power. We are energy beings. Healing is directed energy. Hands on, reiki, herbal, holistic healing was discounted in western medicine for several decades. This is not so in the eastern part of the world, even in all of Europe. Certainly native american tribes have held on to traditional herbs and healings as well as pockets in the United States south etc. Over the last 10 years or so these natural remedies have made a resurgence. Perhaps not in complete replacement of western medicine but certainly in addition to. And that is what our message today reminds us. We have the power to not only take a look at and learn about different ways to heal but also we have healing power within us. Going within and focusing our energy to healing sounds radical but it is completely normal. It is in our DNA. It is a power we are born with but have lost our way on how to access and use it. There is nothing magic about it. We can focus and direct our energy by becoming silent, going within and accessing our power. 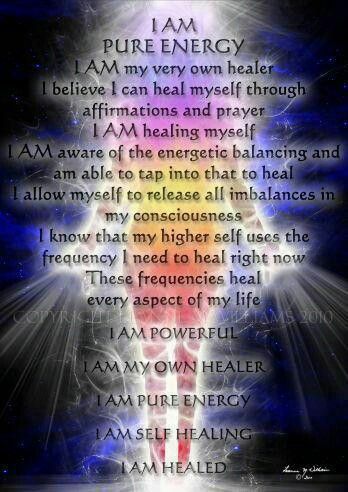 -Use your power to heal the physical and emotional self and others. -A good nights snooze. I think I have finally turned my body clock around. Whew.